IMPORTANT NOTE: All content on this website is owned by Kevin Reabe and is copyright protected. This page contains information about some of my other trailer projects. My preference is for trailers built immediately following World War II by aircraft companies or by other now defunct companies using aircraft construction techniques. 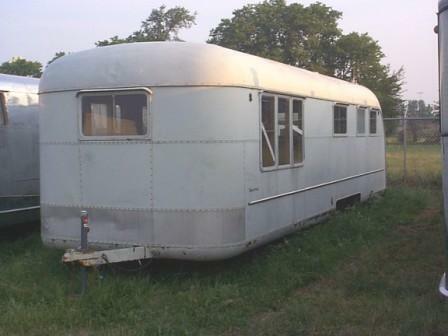 I also have interest in unusual and low production trailers and own a 1961 Holiday House 17. This series of photographs shows our 1951 Spartan Imperial Mansion. The trailer is 36 feet 2 inches long and weighs only 5800 pounds. It is highly original and when found had been owned by the same family for more than 40 years. The trailer has two bedrooms, a bathroom, kitchen, and "observation lounge." The furniture was missing from the trailer, as were the appliances. I built the furniture as reproductions of what was there originally, with the exception of the table, which I built as a reproduction of the 1946 Spartan trailer table. This series of photographs shows our 1951 Vagabond model 262. The trailer is 28 feet 6 inches long. I restored this trailer completely. I added modern conveniences, such as 12 volt system, fresh water and waste water tanks, but I added them so that they are functional but they do not change the feel or appearance of the trailer. The trailer appears as it did when it left the factory in 1951. The trailer has one bedroom at rear, a bathroom, kitchen, and living room. This series of photographs shows our 1949 Palace Royale. The trailer is approximately 24 feet long. The trailer requires a complete restoration.